Ethiopia is land-locked, as a consequence of the secession war with Eritrea. To be land-locked means hardship in some ways. No harbour, no industry that depends on bulk transportation of ore or crude oil, no direct access to trans-ocean fiber cables for Internet. All five neighbouring states have access to seas. But the road via Kenya is very long and impractical, Somalia is in shambles, and relations with Eritrea are bad. So only the Sudan and Djibouti are options. Northern Ethiopia relies much on Sudan for fuel and other imports. The capital and the east and south get it all over the busy road to Djibouti. There is an old narrow-gauge railway from Addis to Djibouti, but that carries hardly any train traffic. Somehow, negotiations with Kenya, Sudan and Djibouti for better Internet capacity seem not to work out yet. By end of 2008, the new Indian Ocean EASSy fiber cable will bring relief to all countries in eastern Africa, but no planning date or upgrade announcement seems to be available from the relevant Ethiopian ministries. Recent reports have it that the country’s total bandwidth to the Internet is about 200 Mbps. Ethiopian telecom ETC distributes this to an increasing base of users, so Arba Minch University’s link (2 Mbps downstream, 512 Kbps upstream) carries fluctuating amounts of data both ways (despite continuous demand) averaging just a quarter of the bandwidth both ways. Response times are terrible, up- and downloads frequently impossible. Even more painful: AMU’s link is a satellite connection, and although many providers could offer well-performing satellite links directly to the Internet, ETC as the country monopolist brings the satellite connection down to Addis first, in order for it to be combined into the trunks to the outside world – and thus to be subject to the same controls that the authorities may chose to apply. Which controls? Not published. An example: no access to Blogspot. Why? Don’t know. Our own weblog is perfectly accessible from here. The work at AMU is great. It is somewhat difficult to understand why ICT is in such an early stage of development, while there is such a pool of excellent brains around, for a large part sitting in heads of strongly motivated people. It is also hard to imagine how adding just one aging brain, with its possible extra of a history of driving ICT infrastructure development, would suddenly help this to change. My own expectations of that are modest. Do not confuse that with motivation! Although I did agree with Hanny that AMU is for weekdays between 8 am and 6 pm max only. There are four low-level posts in the AMU HR budget allocated to ICT. That is for 400 academic staff, several hundred administrative staff, and 8000 students; and for the care of 1200 PCs, printers and photocopiers (estimated, no inventory management) and a 700 port network. Rather insufficient; so diffused support has emerged here and there in faculties. Practically, the four ICT FTEs are used for software installation and configuration of PCs, for classroom ICT preparations, and for repair and maintenance of PCs, photocopiers and printers. Their boss and mine, Fikru, is the ICT coordinator, but is on the payroll of the Electrical Engineering department and therefore still part-time lecturer; competent in ICT generally and skilled in network and firewalls (both Cisco). In his spare time he teaches Cisco stuff to pupils preparing for Cisco certification programs. Fikru succeeded last year in temporarily getting a network engineer and a systems engineer, on external funding that will permanently stop again in August. So the barebones LAN that just provides Internet access as its only general service is now being equipped with a mail server and a caching proxy. When I came, Fikru’s main concern was that AMU’s management did not yet accept that ICT needs to be a support organization in its own right, with its own management and adequate staffing. He and some colleagues visited three other Ethiopian universities recently to compare the ICT situations there with AMU, and reported with an advice to AMU management – but did not get any approval for manpower extension. So to me, reading the existing Strategic Plan and then speaking to AMU management looked like the best first things to do – learn more about vision, goals, drives and constraints. Fikru and I made up a list of most urgent ICT issues in our view and a proposal for how to address these, and spoke to the President and the Academic Vice President with that. The main outcome: please give us more clarity and detail of what needs to be done and why, at what manpower and costs; and do consult all stakeholders for that. Then, management will choose from scenarios offered, decide on priorities, commit manpower and budget, and review organizational consequences. We were given the opportunity to introduce that process in the next management meeting with all faculty deans and heads of support sections. So Fikru and I defined a Catalog of Required ICT Services that in our view are essential to develop ICT at AMU. I filled in much of the detail; first because the subjects and processes are familiar to me, and second because poor Fikru is continuously overrun by staff from all walks of AMU life that hop into his office(phones are scarce) for support, complaints, changes, orders, and lots of other things. As the dearly and temporarily recruited network engineer is away for a few months, for reasons I may touch upon in a next posting, Fikru is network engineer, firewall administrator, problem and change manager, helpdesk, operator, and manager of himself in all those roles, plus manager of his system engineer and technicians. So it is admirable that he saves me from joining the technical fire-fighting (though I also encouraged him to spare me, saying that my hands-on knowledge may be a bit rusty). We have presented this service catalog for feedback to five faculties now (it is nearly end March), taking in their comments and inputs and discussing with them. There are now 10 Service Elements in the Catalog, but some exist of several possible parts. The Network Infrastructure element for instance has a number of different items for management to say yes or no to; each with approximate manpower and budget consequences. Similarly, Central Services are just one service element, with a number of individual services. Imagine how much detail can hide behind that in a mature ICT organization; but AMU presently has just one central service starting: email, plus three services that are not centrally available or accessible: Finance, Registrar and Library. All this effort will eventually (mid April, we think) lead to a request for Birrs, bodies and brains. Birrs, the somewhat devaluation-prone local currency; bodies to make things happen in the ICT Centre (and more: Fikru used students to install cabling earlier); and brains to pick from bright students or instructors that can help implement ICT issues as part of their study assignments. Computer Science senior students can certainly investigate, help implement, or pilot solutions, or create some useful web-based applications for ICT support processes (“who will maintain these later" can be solved too.) A concern would be to plan, channel and manage all such activity so that it really benefits the ICT Centre. Perhaps that is what has so far not been seen by anyone as a useful and challenging task? I could coach someone into it. 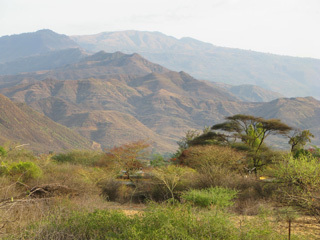 It is Saturday noon and I am comfortably sitting on the terrace of our house, overlooking the rough hillsides of the Great Rift Valley escarpment west of us. We are down below; clouds are now hanging over the usually clear mountains. Some rains last night announced that the rainy season will come soon. Our house is comfortable, having electricity, running water and a fridge. But electrical power cuts are frequent here (at AMU too), and sometimes we are still not used to it. Since midnight there is a power cut now, and to save my laptop battery I actually write on paper. Hanny just prepared the pumpkin soup for guests coming this afternoon on the backup kerosene burner, but forgot that the electric mixer would now also not blend the chunky cooked substance. “Running water” is actually also an overstatement. The houses on our compound get water from the 40 (arba) springs (minch) via an intermediate tank. Too little water is pumped up for continuous supply, so we only have running water between 7 and 8 pm. And when there is too little water in the tank: no water in the pipes, come to the tank please with your jerrycans, and we shall see what we can do for you. Forget the cold shower that time, perhaps that week. Back for the last part. At our departure from Holland, quite a few people gave something for us to spend on a project in Ethiopia that we would consider well worth supporting. We have meanwhile contacts with a primary and secondary school about an hour and a half out of Arba Minch, high up on the escarpment. 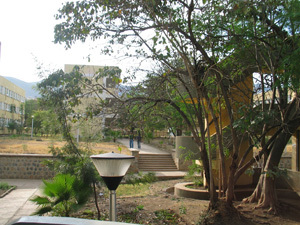 The school has 1400 students; classrooms often have to house 90 students, and classroom furniture is mostly lacking. 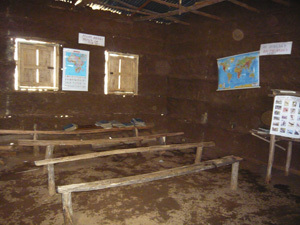 In several classes, pupils sit on the earthen floor, sharing their books. Schools like this are usually set up by the government, but then largely left to the woreda (local administrative unit) to be developed and funded. The school does not have sufficient budget for procuring books and classroom furniture, and will acquire more books. With school benches for 750 pupils, in combination with re-use of the remnants of previous furniture, the situation would already greatly improve. An Arba Minch carpentry association, of which one director is teacher himself at the same time, is specialized in making these benches (seating three children each) out of metal and wood; and a local contact person that we know and who has handled similar projects for a Dutch foundation supports all contacts with this manufacturer, with the transport people, with the school’s acting headmaster, and with the woreda authorities. The ‘farewell money’ we got is certainly not enough for the 250 benches, but some of you indicated that they would perhaps like to contribute to a project like this. If you still do, you are kindly asked to transfer the contribution to our Postbank account 1746600, IBAN NL06 PSTB0001746600, BIC PSTBNL21, and state somewhere the word ‘Eneredada’. That is ‘let us help each other’ in Amharic. We will mail all contributors a report about the outcome of the project around (we expect) July.